Are you planning a camping or hiking trip soon? Then you know that you will need to make some meals out there. Cooking when you are outdoors can be a little bit complicated since you don’t have the luxury of all the items that you need in the kitchen. Again, cooking gets complicated since you will have to deal with rain, wind and other outdoor elements. However, if you equip yourself with the best portable wood stove, you can make your meals comfortably. These outdoor stoves do not produce too much flames and it is easy for you to control the amount of flame that you need so that your food doesn’t burn. 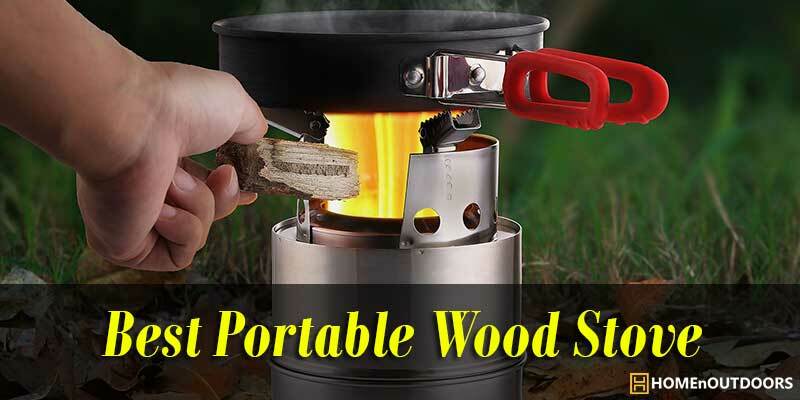 Carrying a portable wood flame is convenient as compared to gas stove that require you to invest heavily in fuel. The worst part is that you can even run out of fuel when you are outdoors. Check out reviews of different types of portable wood stoves that will make a great investment. With the many portable wood stove options available on the market today, it can be pretty difficult to know the right size or type to buy. To make your work easy, check out these amazing wood stoves that are convenient to use when outdoors. Camping is one of the best outdoor activity that helps us enjoy a great time in the woods. The fact that you are far away from civilization doesn’t mean that you should not take your meals. If you are looking for the best backpacking stove to help you prepare your meals, the Solo Stove Lite is one of the best out there that is recommended by Backpacker Magazine. The stove features a compact design making it easy to carry without occupying too much space. One of the major problems that many people face when using wood stove is too much smoke. To counter this problem, this stove features a patented design which means less smoke. It is designed with a unique double wall that allows effective burning of the fuel hence producing less smoke. The good thing is that you don’t have to invest in fuel because it is free. You can use leaves, twigs or wood to cook. When you are looking for backpacking stove, you want a model that is lightweight. This is exactly what you get from this stove. It is lightweight and provides a faster boil time. You don’t have to wait for several minutes when you want to boil water. In less than 10 minutes, the stove can boil 34 fl oz of water. To enhance its durability, this stove is made with premium stainless steel with nichrome wire. You will also receive a nylon carry sack for easy transportation. Ohuhu is one of the top brands that is recognized for quality camping stoves. One of their affordable yet functional portable wood stove is the Ohuhu Camping Stove Stainless Steel Backpacking Stove. The stove is made with a sturdy stainless steel construction making it durable. The best thing about this stove is that it burns steadily and brightly regardless of the condition. When you are cooking outdoors, you want a stable stove such that it doesn’t tip over and cause burns. This model is stable and safe meaning that it will hold well even when it is windy. With the 3- arm base support system, you can be sure of safe cooking. I also love the fact that the stove uses natural fuel hence you don’t have to spend more on fuel. You can make use of dry twigs, wood, leaves and pinecones for kindling. This environment-friendly stove is also compact and lightweight. It is easily collapsible for easy transportation. It also comes with a mesh carrying for comfortable carrying. Since it doesn’t use alcohol or any fuel canister, it leaves the environment clean and with no emissions. Would you like to cook in style when you are on a camping trip? You can try the Biolite CanpStove. This is a portable stove that helps you cook your favorite meals and boil water in less tome while giving you the opportunity to charge your phone. It comes with complete kitchen system since it includes a portable grill, kettlepot, flexlight and campstove 2. The stove can generate electricity and create a smokeless wood flame. It features a USB flexlight that illuminates your cooktop so you can make your meals during the day or at night without worries. Get this revolutionary campstove and transform your outdoor cooking. This high quality camping stove is worth your money and you will enjoy using it outdoors. The stove burns different things like biomass, pellets, pinecones and sticks among others. The stove is also capable of generating 3W power so you can charge your devices when you are outdoor. How convenient is that? This is something that any outdoor love would appreciate in a camping stove. Make your outdoor recreation with family and friends great with the Canway Camping Stove. This backpacking stove is durable, thanks to its stainless steel construction. It makes camping fun and enjoyable because you can boil water or prepare your favorite meals in less time. As compared to gas stove that require you to use fuel, this one uses the natural fuel. You can use branches, wood or leaves as natural fuel. This makes it one of the most environment-friendly camping stoves that do not leave any emission behind. The stove features 3 arm support base to provide the stability required. You can enjoy a safe cooking experience eve when there is wind as well as an even distribution of heat for cooked food. As an outdoor enthusiast, the last thing you need is a heavy stove. This is why this unit is designed with a lightweight material making it ideal for backpacking. You can travel with this stove to different places without any issues. Additionally, the stove comes with a mesh bag that provides convenient carrying without taking much space. Are you having trouble picking a perfect camping stove? Save your worries because the Solo Stove Titan is designed to make outdoor cooking the best. This is a 2-4 person wood burning stove that features a patented design as well as unique secondary combustion. The stove features a double wall make and a unique airflow system making it efficient. With this stove, you will not experience smoke because of its unique combustion system. When it comes to the make, you will enjoy many years of use. It is designed with 304 stainless steel and nichrome wire making it durable. This is a quality product that you can trust for all your outdoor cooking needs. The stove is also economical because you don’t need to invest in fuel. You can use wood, sticks, pine cones among other biomass for fuel. Regardless of where your adventure takes you, you can be sure to find fuel. Another thing that you will love about the stove is its fast boil time. You can boil 32 fl oz of water between 4-6 minutes. If you are an avid backpacker, you understand the importance of having a wood stove. However, not all wood stoves are recommendable. One of the ultra-light camping stoves that you can buy is the kampMATE WoodFlame stove. The stove is easy to assemble and features reinforced side plates and larger air ventilation to enhance airflow. On top of that, the large air ventilation also provides hot cooking temperatures and makes cooking easy. The best part about this stove is that it folds flat. It has an improved design making it even thinner as compared to the previous models. For convenient transportation, the stove comes with a nylon carry case that keeps it in one and safe when it is not in use. The stove is ideal for cooking with wood, cedar pucks, charcoal, stereo fuel and any type of biomass. It features a lightweight design and 304 stainless steel construction that not only makes it suitable for outdoor use but also durable. This stove is also stable enough hence promoting safe cooking. When planning for a group camping, you are probably thinking of having a wall ten that can accommodate everyone in your group. This also means that you need a larger camping stove that can prepare large meals to feed a large group of people. In this case, one of the best portable wood stove that can solve the problem is the Camp Chef Alpine CS14 Heavy Duty Cylinder Tent Cabin Stove. The best part about getting this unit is that it comes with all the necessary accessories that you require. You will find a damper, spark arrestor, internal log grate accessory shelves so you will not have to spend your money purchasing these important items separately. All the parts of the stove are designed in a manner that they fit perfectly well. Everything stay well in its right place making it convenient to cook with this stove. Again, with the removable legs, you can expect an easy transportation or storage when the stove is not in use. You will also enjoy the large cooking surface and door damper that makes it easy to control the heat so that your foods can be evenly cooked. It is designed with a water tank bracket but you need to buy the tank separately. Last but not the least, this stove is designed with a 50-inch chimney pipe that is over 10 feet in height. When it comes to backpacking stoves, there are so many options on the market today such that you can be confused which one pick. Don’t worry because we are here to ensure that you get the right stove that will suit your outdoor experience. Make cooking enjoyable with the Unigear Wood Burning Camp Stoves. This is an ultra-compact camping stove that is different from other cylindrical camping stoves on the market. And the best part about this stove is that it can be folded compactly. It also comes with a carry bag that you can sling it and keep in your backpack. You can prepare your meals using twigs, pinecones, leaves or wood. Designed with quality stainless steel, this rugged backpacking stove will last many years. It is easy to assemble and provides a stable cooking place with even distribution of heat so your food is perfectly cooked. With just 3 simple steps, you can easily assemble this stove. Its simple construction makes everything easy even if you have never assembled one before. One of the best thing about portable camping stoves is that they don’t limit you when it comes to fuel. You don’t have to worry about running out of fuel in the middle of nowhere as compared to using gas stoves. If you are having trouble selecting a good camping stove, try the Überleben Stoker Flatpack Stove. When using this stove, you don’t have to think about fuel canisters or buying fuel. It works with organic matter that is readily available. You can use sticks, twigs, pine, bark, cones and much more to cook your meals. You can also use charcoal, Esbit tablets or wood pellets with an alcohol stove. Made with HD 304 stainless steel, you can expect maximum durability and stability with this stove. It is designed with the highest quality material to offer a long lasting use. On top of that, the stove is anti-corrosive and very strong as compared to other models on the market today. Another thing that you will love about this stove is its minimalist flatpack design. It features 5-panel design packs that will slide easily in your backpack for convenient transportation. The stove is also designed with natural canvas sleeve that is unwaxed and you can choose the right finish depending on your preference. If you are looking for a durable and affordable camping stove, it can be a great idea to buy the Lixada Camping Stove. This stove features a tough construction since it is made of hardened stainless steel material to enhance its durability. It is designed to suit camping and rugged backpacking hence the superb construction. You will also love its smart design featuring an open mouth which makes it easy to add wood. The best part is that the stove is easy to assemble with minimal efforts. You can cook your meals conveniently and safely because it is stable on the ground. You don’t have to buy a specific type of fuel to use with this stove. It works well with twigs that you can easily collect. This means that you will save more money that you would have used to for purchasing fuel. Again, the stove is environment-friendly because it does not produce emissions, no batteries required and no fuel canisters needed. When you are going for camping or hiking, you want to carry lightweight items so that you will not have to deal with too much weight. You need a lightweight and portable backpacking stove that will be easy to carry. Check the weight before you buy so that you can get the right one that suits your needs. Wood camping stoves also come in different sizes. What are the dimensions of the stove? Can it fit in your tent? Can the stove fit well in your car? These are some of the most important questions you should answer so that you can get the right sized wood stove. You should have in mind that you will be cooking outdoors. This calls for a stable stove that is not likely to get blown when there is wind. Additionally, the stove you choose should be safe such that it doesn’t tip over when you are using it. Make sure that the legs are strong enough to prevent any accidents. It is also important to consider some of the most important accessories that accompany the stove. These accessories enhance ease of use. Some of the most important accessories that you should check is the windshield, stove jack, spark arrestor, wood grate and pipe damper among others. Portable wood camping stoves also carry different price tags depending on the features and the brand. It is important to compare the price of different stoves so that you can get a suitable model that meets your budget needs. There are different ways in which you can prepare meals when you are outdoors. You can choose to start fire or use a gas stove but the most efficient way is having the best portable camping stove. Selecting a wood camping stove should not be hard after going through this guide. We covered quality portable wood stoves that any outdoor enthusiast would love. Theses stoves are portable making it easy to carry on your trip. We also covered wood stoves that are lightweight, perfect size, easy to start, durable, stable, energy efficient among other great features. Depending on the features you want, I’m sure you can pick the right stove from the top ten reviews above. I have given you more options so that you can choose the right wood stove that matches your camping style. Select the best one and enjoy the best outdoor experience with your family and friends. Top 10 Best Dual Fuel Generators in 2019 – Reviewed By Expert!